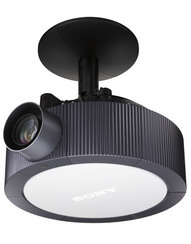 Sony is expanding its line of video projection systems a couple of new LCD models for larger-venues that, while not exactly impulse buys, are priced within the range of many organization. The new VPL-FW300L (7,000 lumens) and the VPL-FH300L (6,000 lumens) projector models are ideal for smaller auditoriums, large classrooms and meeting rooms, museum exhibits, event centers, ballrooms and movie theaters for displaying pre-show content. ‚ÄúThere‚Äôs no ‚Äòone size fits all‚Äô option for large-venue projection needs,‚Äù said John Kaloukian, director of Sony Electronics‚Äô professional display group. ‚ÄúFor example, museums are featuring more full HD content in their exhibits and need HD capable projectors that show this footage quietly and effectively. The VPL-FW300L projector has a WXGA+ resolution of 1366 x 800, while the VPL-FH300L unit delivers resolution of 2048 x 1080. Both models are housed in the same chassis, and share the same type of lenses, lamps, and filters as well as the same connections and network functions. The VPL-FW300L and the VPL-FH300L projectors are planned to be available in January, at suggested list prices of $27,000 and $40,000, respectively. At $27,000, we’re not going to be buying one of these anytime soon. But at that price, we can anticipate new types of theaters and performances based on digital video, computer graphics & Internet content developing. I would like to know what would be the cheapest way for making a movie theater, I make low budget films on my web site so some time I want to present them not just through the website but through a theater.